Trying to find infant child care can be stressful and overwhelming, especially for first-time parents. 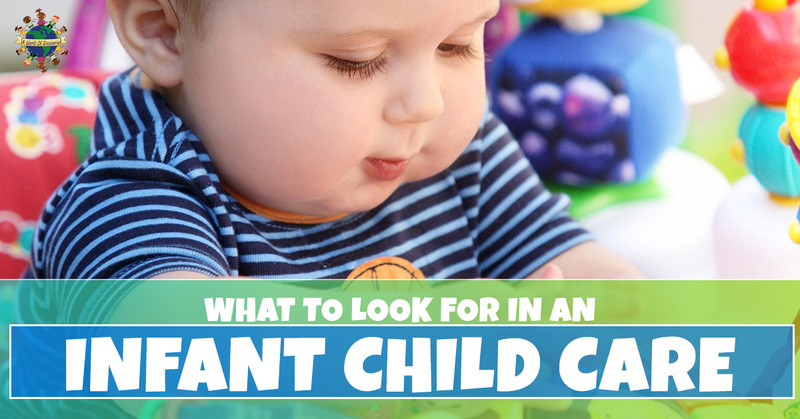 When looking for infant daycare programs, there are certain things that you will want to look for and things you’ll want to avoid. In this blog, we are going to review some of the qualities to look for in an infant child care program. When looking for child care for infants, you will want to look for a child care center that has a warm and nurturing environment that will most likely be an infant’s second home. The teachers or caregivers at the center should be consistently interacting with the infants in their care, as this is essential in the development of children’s social behavior. Additionally, to accommodate infant mobility, infants may need to be divided by age group. For example, because of different needs, ages six weeks to nine months may be appropriate for one room, and nine months to 18 months in another. You should look for a child care center that offers infant programs where each child participates in individual gross motor activities, fine motor activities, and social play. Daycare center programs should implement encouraging activities which allow the babies to experience different tactile sensations or practice verbal exercises, no matter how far along they are. When searching for a child care program for your infant, your child’s development over time should be one of the main focuses and influences on your decision. Find a child care program that implements a reliable reporting system, so that you can see your child’s cognitive-behavioral and physical growth. An infant child care center will provide you with information regarding your baby, such as nap times, meal times, etc. It’s essential that the childcare center you choose is clean and baby-proof so that your infant can be mobile and explore their surroundings and practice their motor skills safely. Encouraging learning through play is a great way to stimulate your child so they can enjoy their time while also indirectly learning about the world around them. Be sure that there are separate eating and diapering areas as to maintain tidiness. When you are searching for a daycare for infants, there are certain factors that need to be considered. If you need infant care in Columbia, MO, look no further than A World of Discoveries daycare! We currently have openings for our infant child care programs. To learn more about our in-home daycare, contact us!